When Portuguese sailors stumbled upon Taiwan in 1547, they named it Ilha Formosa meaning “Beautiful Island”. Taiwan is only 160km (100mi) from the mainland where the government of the People’s Republic of China (PRC) have ruled since winning the civil war against the Republic of China (ROC) in 1949. The ROC government withdrew to Taiwan and continue to dispute the political rights of the PRC and maintain some sovereignty over Taiwan and the 90 small islands of Penghu (Pescadores). Despite the confusing situation, surfing in Taiwan has a long history and surf arrives from a generous 225º swell window hitting all sides of the island. US soldiers were the first to ride the north coast beach of Jin Shan in 1965 and local pioneers like Mao Guh and his brothers ignored the Taoist suspicions of the sea and government ban on access to the ocean, to take up surfing. Mao Guh opened the original and still popular Jeff’s Surf Shop near Honeymoon Bay and with the lifting of Martial Law in 1987, surfing clubs popped up across the island and Jung Wen-Chen, founder of R.O.C Surfing Association, estimates that there could be 25,000 people riding waves across Taiwan. This is no surprise as the seasonal monsoons bring consistent waist to headhigh waves and a pair of boardshorts will do for all but the depths of winter, making Taiwan an increasingly alluring tropical destination. Taiwan sits smack dab in the middle of Typhoon Alley and the biggest swells of 8-12ft (2.5-4m) usually occur from July to October. Category 1-3 storms can appear in less than 24hrs, while super-typhoons Cat 4 and 5 usually take days to wind up, with potential for destruction, depending on the storm’s track. Any violent storm activity in the western Pacific can create some waves, but consistency varies greatly, year to year. 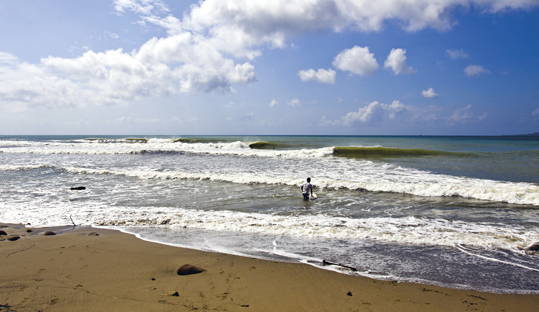 In the summer, knee to waist high is the average surf height pushed in by the SW monsoon winds without any typhoon activity. The most consistent surf is generated in winter from NE monsoon winds, which bring chest to headhigh waves almost everyday with potential 8-10ft (2.5-3m) peaks. North and east Taiwan has many spots that pick up even a sniff of swell (Yilan, Hualian) while the southern region has a myriad of breaks that need a bit of a look around to find (Taitung). Tides are semi-diurnal with diurnal inequality but hardly reach more than 3ft (1m). Kenting has a warm tropical climate with rich and fertile vegetation. There is little change between seasons. Summer weather is cooled by the afternoon sea breeze and although winter winds are cooler, it is still warm. Temps are generally between 19°C and 28°C (66-82ºF) all year-round. Annual average rainfall is 2200mm (88in) mostly caused by summer typhoons. Springtime sees afternoon thunderstorms, while autumn and winter have a windy season with the "Lo-Shan-Fong", a violent wind that causes sandstorms. A springsuit is enough for winter, even for the few weeks in January and February when air temps may dip to 10°C in morning offshores. Boardshorts from April to November and then some. A steep central mountain range means the east coast is much less developed than the overcrowded west coast, which makes Taiwan second only to Bangladesh in population density. Lots of sightseeing near Taipei like museums, temples (Shihtoushan Buddhist) and waterfalls (Wulai). Tamsui Grass skiing resort near Paishawan. Many mountain peaks reach 3000m+, try hiking near Chushan or rafting on Hsiukuluan River (east coast). Kenting National Park hides beautiful forests. Waves hardly ever reach dangerous size except during typhoons when all beach activities are banned if a warning has been issued. Some volcanic reefs can be treacherous. Beware of concrete tetrapods! Crowds are increasing near Taipei and Nanwan, riding skills are improving and localism is an issue in places. Big cockroaches and aggressive mosquitoes. The “9-21” earthquake in Sept 1999 killed 2500 people. There’s good gear among the dozens of surf shops. Expect $600 for a shortboard and $900 for a longboard. Rentals are $20/d. In Taipei (Johnny Rose, Tube Factory), Ilan (Blue Ocean, Cool), Kenting (Hotel California, Beach House) or Jialeshuei (Pintung), will all help find lodgings, surf tour, school, rentals, etc.